I thought it may be helpful to tell everyone a little bit about the equipment I use in the kitchen. I cook, and I’ve cooked for a long time, but I know many of you are not cooks, and the kitchen is an intimidating place. If you are going to be successful following the Paleo lifestyle, YOU HAVE TO COOK. In addition, if you are going to stick to it, YOU HAVE TO LEARN TO COOK MORE THAN THREE THINGS! So, I’ll periodically add items I use in the kitchen to the discussion that I feel are essential to cooking at home. Please understand that since I cook daily and put a lot of time into it, I have spent years assembling a good quality kitchen kit. You don’t have to spend tons on these items for them to work (my wife has in fact accused me of spending too much on my kitchen equipment…but I’m just not sure she’s right!). You just need good quality stuff if you want it to last. Knives: To me, the most essential item to own is a good knife, or several for that matter. The good thing is, eating Paleo saves you money on one of the traditionally listed “mandatory” knives…you don’t need a bread knife 😉 At the bare minimum I suggest a chef’s knife (or Santoku), a boneing knife, and a pairing knife. If you wanna splurge, add a nice long carving knife. Get the best quality you can afford, and treat them nicely. Hand wash them immediately after use and put them back in storage. I use the Shun Elite Series knives, and probably (definitely) have more than I need…but what can I say. Yes, they are an investment, but they look so cool! Lastly, keep them very sharp. Mine are dangerously sharp and I aim to keep them that way. In fact, I sent three of them this week back to the factory to get resharpened professionally. A good knife will actually help you cook faster on a daily basis as it makes prep much faster and safer. 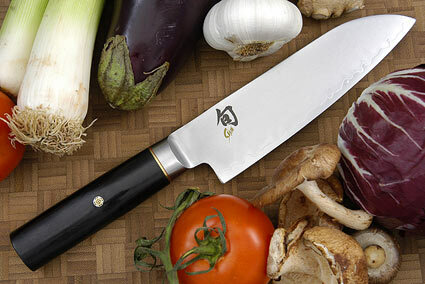 Cheaper alternatives include the Shun Classic series and anything by JA Henckels. Cutting Board: So to go along with good knives, you need to have a good cutting board. I went to a friend’s house the other day and was helping her cook dinner and I asked for a cutting board. I swear she gave me a little 6 x4 inch plastic thing…problem was, I was cutting up a whole chicken! You need two cutting boards minimum. Any old synthetic cutting board will work for cutting up any meat as you want to easily be able to wash and disinfect it after use. You could use a wooden one, but the risk of contamination is much too high for me. You also want a nice wooden cutting board to cut everything else on. I cook all the time, and my cutting board just sits out and is used all the time. It’s basically part of the decor. I have an awesom JK Adams 18 Inch by 3 inch Cherry Wood board that will literally last forever. Yes, its pricey, but its the last one you’ll ever buy, and its beautiful. It will never warp, and with a little oil rub down every month, it will stay perfect forever! This is a kind of one time purchase for your kitchen you’ll never need to replace. At the least you want to have a wood board for cutting everything but meat, and a plastic board for meats and seafood. Spice Grinder: I can’t do without my spice grinder. Anything at all you want to whirl into submission is easily taken care of with one of these. 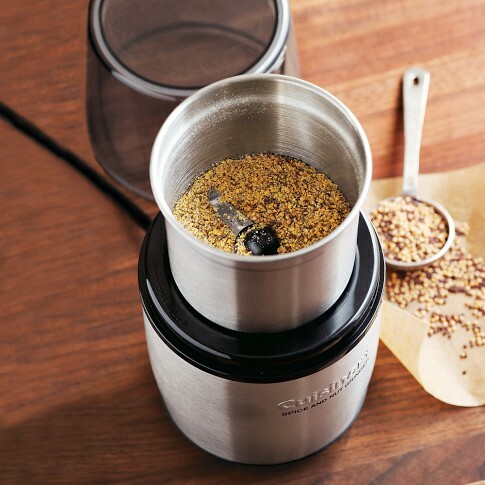 Whether it’s something as simple as grinding a batch of peppercorns for the week’s use, or a more complicated spice mix like Nom Nom Paleo’s “Magic Mushroom Powder” this little device is perfect. The model I have is around 40 bucks, and I love it because the chopping bowl is removable and dishwasher safe. It can be hard to clean around those blades at the bottom by hand! Learning to use spices and make your own spice mixes can really take your cooking to the next level. 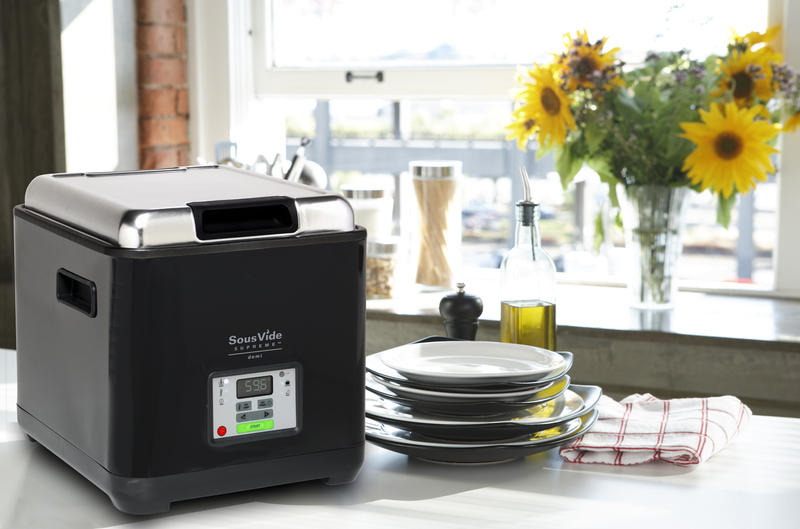 Sous Vide Supreme: This is a relatively new addition to my kitchen, but it has fast become a workhorse in my day to day cooking. For those not familiar with sous vide cooking take the time to look into it. In a nutshell Sous Vide is french for “under pressure” and it is nothing more than a precisely controlled water bath in which to cook food. You vacuum seal your food, place it in the water bath for the minimum amount of time to cook, or really as long as you want within reason. The longer your food soaks the more tender it will become. Things that are already tender like fish or a tender steak do not need more time than what is required to bring it fully up to temperature. It all depends on the dimensions of your food. Tougher cuts of meat do well to sit in the bath for days to become more tender. On a recent post I soaked a chuck roast for 48 hours and the results were like a prime rib. I will make a specific post on sous vide in the future, but for now consider it a major member of my essentials club! I own a Sous Vide Supreme Demi, which is pretty much the most affordable unit short of hacking your own. I also recommend an amazing mobile app called Sous Vide Dash that calculates cooking times with geeky precision! 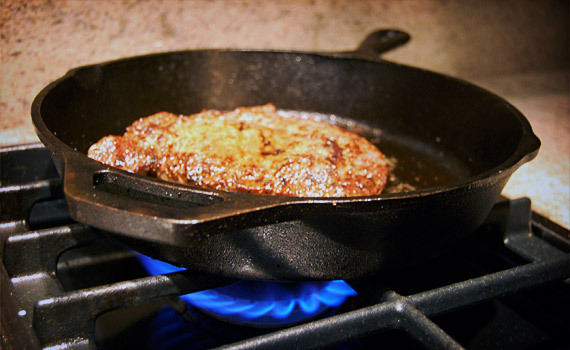 Cast Iron Skillet: I love my cast iron skillet. I got it around 10 years ago, and it has a perfect seasoning to it so that nothing sticks, clean up is a snap, and it gives great consistent results. I also plan on passing it on one day to one of my kids! Crazy yes, but those of you who covet your skillet like I do completely understand. Nothing transfers heat better, and there is no better partner for my Sous Vide to finish off dishes with the perfect sear. 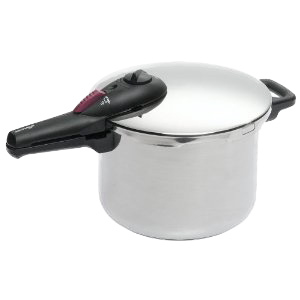 Pressure Cooker: Many people (including my wife and my son) are very afraid of pressure cookers. I completely understand why as they make lots of noise, and everyone is afraid they will blow up causing damage beyond measure. I haven’t had a problem with mine yet, and it’s a pretty standard Fagor model that was around $40 at a local kitchen store. A pressure filled environment creates essentially a super heated cooking environment that cooks things in a fraction of the time conventional cooking does. It’s fun to experiment with different dishes to try to make them faster. A good example is my Ropa Vieja dish I adapted from a great website called Health-Bent.com. I cooked the beef for 25 minutes under pressure, and it was ready to shred in no time! Check one out and you won’t be sorry. I LOVE that you emphasize that to be healthy, YOU HAVE TO COOK. It really is as simple as that, no exceptions. We live in a society of 40+ hour work weeks and convenience. So most people claim they don’t have time to cook, so they eat unhealthy, processed, convenience foods (grains especially). They then go to the doctor and receive convenient pills/medications to solve their many medical issues, instead of changing their lifestyle. I’m in the process of going paleo at the moment and I wont lie…I AM one of those 40 hour a week workers with a baby under 1 and ‘no time’. I also have always hated cooking because it felt like another job to accomplish. I really appreciate this blog entry because I honestly have no idea what I’m doing in the kitchen and need this list! A friend offered to give me a crockpot…I just have no idea, is that like a pressure cooker? Ok. Obviously this is going to require more research on my part, but as JessD points out, to be healthy, you have to cook!! Looks like giving up pretzels and cheese wont be the hardest part of this process afterall….